What is SikhNet thinking? Sikh Net's comments on news articles show disdain for orthodox Sikhs ! "I am sorry to read that the Sikh Community of the UK wishes to compete for being the world's most backward religion - entering the shameful community of the world's self righteous fundamentalists. May God & Guru forgive you for blackening the name of Sikh." Followed by Ram Das Singh, Yogi Bhajan's old assistant chancellor who says: I totally agree with your sentiments (Baba Burt's comments that is). Here's the link to the SikhNet article and a little extract. The comments are the interesting part. 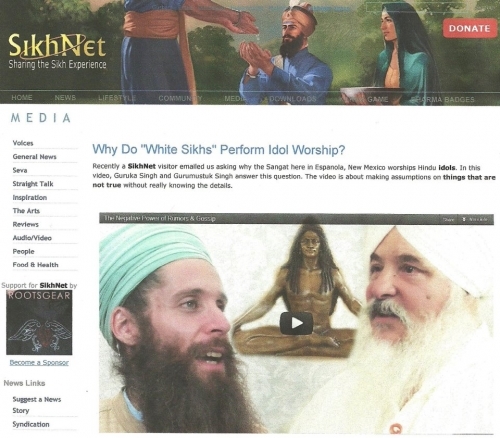 You have to ask yourself: What was SikhNet thinking? But who can blame Yogi Bhajan's followers when they are doing only Yogi Bhajan's bidding? Read this excerpt from a 1989 Yogi Bhajan lecture where Bhajan calls traditional Sikhs from the Punjab "Fanatic Sikhs" & says "Indians are crazy": From Anarchy and Infinity, a Gurdwara lecture given by Yogi Bhajan in Espanola in 1989. "You know what 'third eye' means? Third eye means it sees what your two eyes do not want to see. That's Kundalini Yoga. I'm sorry to give a plug for it. Fanatic Sikhs will never like it. "Oh God, how can... he's a yogi! He's a Hindu! He talks always about yoga! It is not a Sikh Dharma!" And these Indians are crazy! They don't know what they are talking about.